This hotel is located on a cliff top in Santorini and offers spectacular views of the caldera and the Aegean Sea. All rooms have a spa bath and balcony. Please inform Aeolos Studios & Suites in advance of your expected arrival time. For this, you can use the special requests section when making the reservation or contact the accommodation directly. The contact details appear on the booking confirmation. If you plan to arrive after the 21: 00, inform Aeolos Studios & Suites in advance, as the reception closes at that time. For this, you can use the special requests section of the reservation form or contact the property. This studio is located next to the hotel's pool and offers views of the sea, the volcano and the sunset. It also includes a covered hot tub for 2 people. Upon arrival we offer 1 bottle of wine and 1 bottle of mineral water. This spacious suite features comfortable large 1 bed and private veranda overlooking the volcano and outdoor non-heated hot tub for 2 people. The suite also includes separate living area with heated indoor hot tub for 2 people. Upon arrival guests are offered a bottle of wine and a bottle of mineral water. This accommodation, located on the top floor of the property, features a seating area with stunning views of the sea with 3 windows, an indoor hot tub for 2 people next to a window overlooking the caldera and a private veranda with panoramic sea views. to the volcano. Studio equipped with indoor hot tub for 2 people, air conditioning, large mezzanine bed and balcony overlooking the Aegean Sea. It also includes a hairdryer and free toiletries, a kitchenette and a flat-screen TV with satellite channels. The WiFi signal may be weak in some areas. Cave studio with air conditioning, covered hot tub for 2 people, free toiletries and hairdryer. There is a flat-screen TV and a kitchenette. Suite with 2 bedrooms and 2 spacious bathrooms, both with a whirlpool tub. It has a separate seating area with sofa and a dining area for 4 people. It has a large porch with outdoor hot tub for adults 2-4 (not heated) and views of the volcano. Upon arrival a bottle of wine and a bottle of mineral water are offered. Located on the highest floor of the property, this air-conditioned studio has a balcony with an outdoor hot tub for 2 people and views of the volcano and the Aegean Sea. It also includes a large 1 bed with panoramic sea views, a flat-screen TV, a kitchenette with a mini fridge and free WiFi. Studio equipped with a hot tub and an outdoor hot tub (not heated), air conditioning and a flat-screen TV. 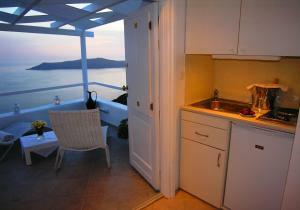 It also has a balcony with views of the Aegean Sea and a kitchenette with a small fridge and free WiFi. This cave studio offers air conditioning, an indoor and heated hot tub for 2 people and 1 large bed in the loft. 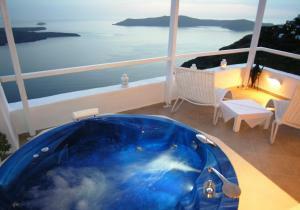 It communicates with the shared pool area of ​​the hotel, which enjoys views of the Aegean Sea and the caldera. There is a bathroom with a shower, a hairdryer and free toiletries, and a flat-screen TV with satellite channels.